Here’s another painting inspired by the beautiful Cincinnati Skyline. This 24″ x 36″ acrylic on canvas painting of the historic John A. Roebling Suspension Bridge, titled Golden Evening Suspension. 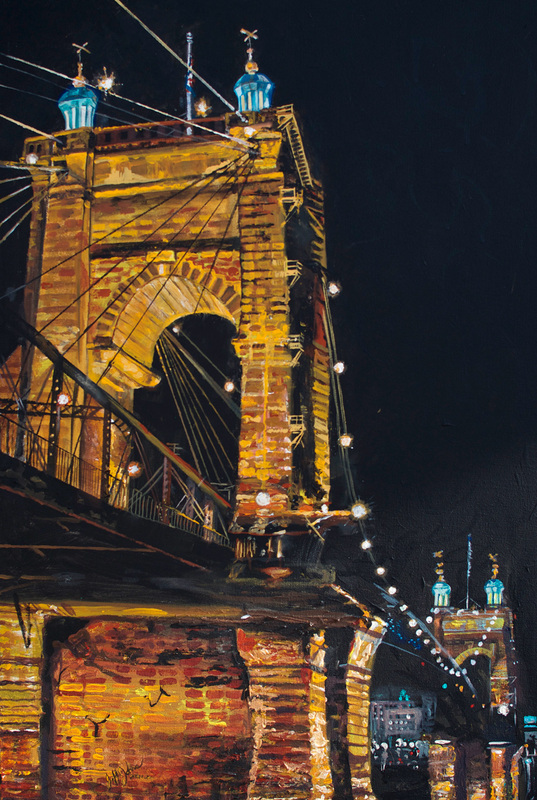 This painting showcases the strong foundation and vivid structure of this iconic Cincinnati landmark. The perspective for this piece is from Covington, Kentucky, so you’ll notice a small section of the Cincinnati skyline on the opposite side of the bridge. At night, this bridge has the most beautiful gold color reflecting into the water and just bouncing from ripple to ripple. I don’t think I’ll ever stop painting this Cincinnati icon. This particular painting is extra special to me. So special in fact, that 8 canvas prints were made of this piece so I could give them as gifts to the groomsmen in my wedding. This entry was posted in artwork and tagged Art of Cincinnati, Art of City Bridges, artist that paint cincinnati, Artists that paint Cincinnati, Bridge Art, Cincinnati, Cincinnati Art, Cincinnati Artist, Cincinnati Artwork, Cincinnati Bridge Art, Cincinnati Fine Art, cincinnati fine artist, cincinnati fine artist jeff johns, cincinnati Jeff Johns, Cincinnati Painting, Cincinnati Paintings, Cincinnati Skyline, Cincinnati Skyline Art with Bridge, Cincinnati Skyline Artwork, Cincinnati Skyline Paintings, Cincinnati Skylines, Cincinnati Suspension Bridge Art, City Bridge Art, creative, Creative Director Jeff Johns, fine art, fine art by jeff johns, Golden Evening Suspension, John A. Roebling Bridge Painting, Painting of Cincinnati Bridges, Suspenion Bridge Art by jefferyjohns. Bookmark the permalink.